Analysis: Donald Glover's New Childish Gambino Video, 'This Is America' NPR Music's hip-hop journalist Rodney Carmichael breaks down the political and racial nuances of Donald Glover's new video. 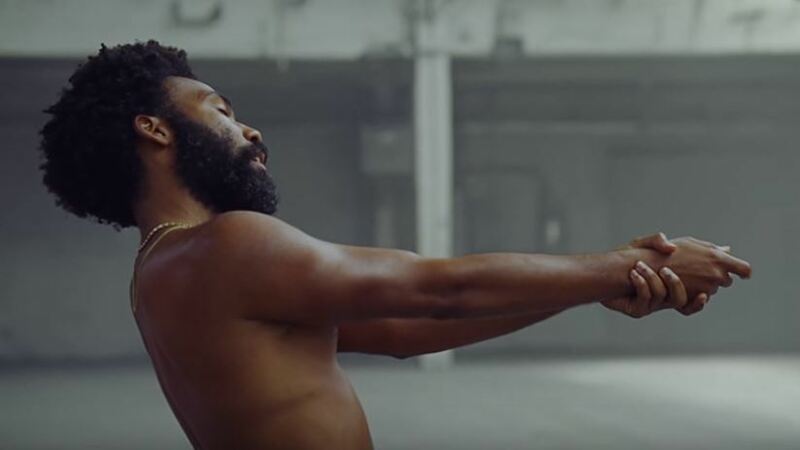 A still from Donald Glover's "This Is America" video. What a weekend it was for Donald Glover. The 34-year-old rapper, actor and producer hosted Saturday Night Live, appearing as both as the host and the musical guest. He performed two new songs under his stage name, Childish Gambino. But it was the performance and subsequent video release of his new song, "This Is America," that has had everyone talking since its late-night release. The song's visual starts with this striking juxtaposition. Over South African-sung melodies, a black man in a chair is playing a guitar in an empty warehouse while a shirtless Glover sings with his back to the camera. Glover alternates between tribal dances and viral dances while flashing an exaggerated minstrel-like smile. The first shock in the video — one of many — comes when Glover takes a pistol and shoots the man playing guitar in the back of the head. "The South African melodies suddenly give way to this really dark Southern American trap music," NPR Music hip-hop journalist Rodney Carmichael says. "The rest of the video is this barrage of symbolism and chaos." There are Jim Crow imagery, dancing schoolchildren toting firearms and a black gospel choir. Glover opens fire on the choir, a seeming reference to the Charleston church mass shooting of 2015. "I think in a lot of ways what Glover is trying to do is really bring our focus and our attention to black violence, black entertainment [and] the way they're juxtaposed in society. They seem to cancel each other out in the greater public consciousness," Carmichael explains. The closing scene of the four-minute video shows the artist running from a mob of people with an expression of horror on his face. "It feels to me like it's a black man running from a lynch mob," Carmichael says. Some have also taken the scene to depict him trying to escape "The Sunken Place," a reference to Jordan Peele's 2017 racial horror film, Get Out. "Either way, it is representative of this history of violent white supremacy." Glover is enjoying a mainstream moment right now. His FX show, Atlanta, which Glover executive-produces, writes and stars in, has earned Golden Globe awards. He won his first Grammy Award earlier this year for his 2016 song "Redbone." He is starring in Solo: A Star Wars Story this spring. As Carmichael argues, Glover is using his moment to bring attention to the perils of his people, especially following Kanye West's controversial statements on slavery and public alignment with President Trump. "We're really kind of grappling with what our entertainers at that level do with the spotlight they have on them; what kind of message are they projecting out into the world," Carmichael says. "I think with Glover, he wants to be putting out the concerns of black folk, of folks who are voiceless in this world. And I think he wants to present it in a way where it's as challenging to his audience as it is to those outside on a mass scale." Web editor Sidney Madden contributed to this story.